Is a PhD Really Worth It? or Just a Waste of your Time? Different people have different opinions. When it comes to the matter of education, there are a variety of opinions which people put forward. Some people say that having high educational qualifications is very necessary if you wish to make it to the top of your respective career. Whereas on the other end of the spectrum there are others who say that as long as you are good at what you do and passionate about your job, your educational qualifications really do not matter. What is a PhD Really Worth? 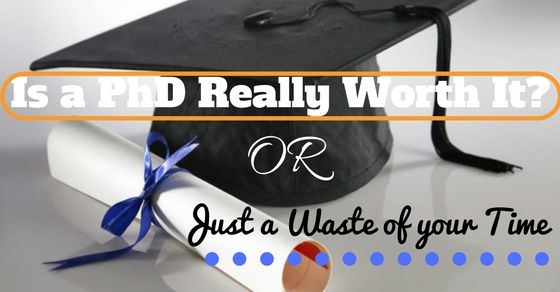 Many people ask the question, what is a PhD really worth? No individual can give an exact estimate of what a PhD is worth, but getting one is truly both noteworthy as well as exceptional. Working hard for a few years does yield rich dividends for you in the time to come. Based on the career you would like to pick, having a PhD becomes either important or not. For some careers like becoming a scientist, researcher or even a professor getting this degree is an absolute must. If you know for a fact that you do not need to be a PhD to make it big in your desired line, then you need not waste your time doing it. The worth of this degree varies from person to person. Prior to embarking on a PhD it is advisable that you consider a few things. The first thing to consider is that in order to get this title, you will have to struggle for a number of years. During this time you will be unable to make a proper living for yourself and if you have a family, it is unlikely that you will be able to focus on both your job as well as your studies. If you have too many things weighing you down on the personal front, that is surely going to make things all the more complex for you. Before you make your decision to do your PhD, it is advisable that you keep in mind, that when you are doing your PhD, you will not have time to interact and meet a lot of people. Most often, you will be at home studying or be in the library doing some research work. If you are a social individual who loves meeting new people, living life like this might make you feel extremely low as well as depressed. A PhD is not something which is attained in the matter of a few days or weeks, so think about what you are getting into before making your final choice. If you wish to become a PhD you will need to put in a lot of effort on your part. During the interim period of time while doing your research and writing your thesis, chances are that you might often feel like giving up. There are many individuals who give up on their dream after they realize that it does involve a lot of hard work. Yet if it something you really want, then you should be willing to give it your all. Ensure that you have a strong mind and heart which is never willing to give up under any circumstances. Many people are of the misconception that the time is going to fly by very swiftly, but this is not so. Mentally prepare yourself for the fact that the days are going to seem like they are dragging by. You will have to work on your thesis or dissertation day in and day out and if the final product of your labors is not good, then you will not receive your doctorate. It is for this reason that before you make your decision to do your PhD, you must ensure that this is a subject which you are good at. Just because you were good in a subject during college and through university that does not imply you have a nature flair for it. Make sure that you actually have the aptitude for specializing in the subject. Having a PhD is something which is both prestigious as well as honorable. Not everyone has what it takes to get the title of PhD or DPhil. PhD’s are generally of two kinds. Firstly is the kind which is earned by an individual after extensive period of study and the submission of a thesis or dissertation, on the other end of the spectrum some individuals are given an honorary PhD for achievements in various fields. Getting a PhD is a dream come true for many, yet at the very onset you should realize that getting a PhD is not the be all and end all of life. You can surely be successful on the professional front even if you do not have one. Getting a PhD is not going to be cheap at all. In addition to not being able to make much money at such a time, you will have to shell out a great deal of money to pay for your further education. If you are not financially well off, then it is advisable that before you make the decision to do your PhD make sure you have sufficient funds to do so. Many students take some time off from their studies in order to make enough money, so that once they start preparing to embark on their journey towards attaining their PhD they have nothing standing in their way and posing as an obstacle. Believe it or not, many PhD students say that in the course of their journey towards getting a PhD they often feel a great sense of frustration. Frustration at the fact that things are so hard or Frustration at the fact that they are unable to defend what they set out to. However what they find most frustrating is that they watch all their other friends going ahead and making money in the corporate world and they have to be stuck indoors trying to get a job done. While attempting to get your degree you will naturally fall behind others in terms of work experience, yet what you should remember is that after you do get your degree, you will be way more qualified than these people with the experience. If you are someone who is not very focused in what you do then it is advisable that you do not opt to do your Phd. In order to get your PhD it is of paramount importance that you treat the matter with gravity and really give it your best shot. If you blow the opportunity, that is going to just fill you with a sense of sadness and depression. In order to help you along the way, you should try your best to learn to channelize all your energies into one endeavor so that your attention doesn’t waver when you are trying to work on your dissertation or thesis in time to come. Only those who are very bright manage to get PhDs. This having been said, if you do not have a genuine love for the subject then you will surely not succeed in your endeavor. It is only when you are really sure about what you want to do in your life that you should set out to do your PhD. If you have a genuine love for the subject, then you will enjoy working on your thesis or dissertation, yet if you are not truly interested in it, it is bound to become both a burden as well as a nightmare for you. One of the biggest benefits of getting your PhD is that it will be a huge boost to your confidence. If you are lacking in confidence then getting anything done is not easy. If you act humble and meek in the work place then no one is going to take you seriously and everyone is likely to try and take advantage of your goodness. Once you get your PhD you are bound to have gained both maturity and self confidence which will surely serve as a major benefit to you in the long run. Getting a job is a source of major trouble and worry to those who are not very well qualified. On the other hand companies are waiting with arms stretched out to hire PhDs who always serve as an asset to any company with their in-depth knowledge and analytical powers. A person with a PhD is always used to relying on his own instincts and that is why it is unlikely that you will ever find a PhD trying to pass the buck on to someone else. One of the major benefits about doing your PhD is that it is bound to earn you a great deal of respect among your family members and friends. Whether we would admit it or not all of us would like to make our loved ones proud. When you get your doctorate, you can rest assured that they are going to be over the moon about it. Yet even more important than this, is that you are likely to receive a bigger salary than the others in the company who are not as well qualified and educated as you. Many a times, people who do not have a PhD do not have a complete in-depth knowledge of the subject they have studied. They are people who have studied things only in the syllabus during their masters and they have not had the opportunity to expand their wings and really explore the subject. A major benefit of having a PhD is that you will have a holistic understanding of your subject. One of the major benefits about doing your PhD is that it is bound to earn you a great deal of respect among your family members and friends. Whether we would admit it or not all of us would like to make our loved ones proud. This is just one of the many benefits of getting a PhD. This is not something which has any monetary value but it is certainly beneficial on a personal front. Rather than trying to learn from other peoples mistakes or do exactly what someone else has done, it is advisable that you follow you own heart and mind and function as per what you think is best. If you think getting a PhD is something you really want then you really should not let anything get in your way. If you start over thinking things you will only be wasting a lot of your time. Rather than pondering too much, try and make a decision. This having been said, at a later point in your life if you regret not having got a PhD you could always go back to university and get one, age is just a number and it should not stand in the way of letting you achieve your hearts desires.